Once a young man (or sometimes an older man) joined the army, he was supposed to be examined by a surgeon or doctor. Obviously, some surgeons faithfully did their jobs. 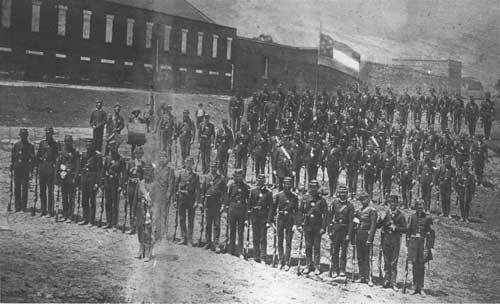 There were 27 men rejected from the 37th North Carolina Troops. Not once do the compiled service records list why these men were rejected. Usually, it has their enlistment date, and simply that they were rejected. It is unclear if they were examined by a local doctor, or if they were rejected once they arrived at camp and were examined by a post surgeon. Many of these men later joined other regiments. Soldiers seldom wrote home about the process of being inspected by a surgeon. Surg. Walter T. Adair 2nd Cherokee Mnt. Vol. But there were obviously lapses in the inspection process. Sarah Malinda Blalock joined the 26th North Carolina Troops in March 1862, under the name of "Sam Blalock." She posed under the guise of her husband's younger brother. She was in the army for a month, apparently never examined by a surgeon. It was only her disclosure, after her husband's discharge, which led to her dismissal from the army. It would be interesting to note (or track) any upticks in a regiment's members on a sick list, before and then after February 1863. Of course, new regiments suffered from measles, mumps, and a host of other calamities that ran rampant through the camps. Was there an uptick of new recruits (post February 1863) hospitalized for one of the ailments listed above? A more serious question would be: how did the revised regulations strain the Confederate hospital system? I'll be watching for mentions of new recruits being examined as I continue my read through Confederate letters and diaries. The title of this post seems to have a simple answer: join the Confederate army, or, as the song says, "Jine the Cavalry." But it is a little more complicated. There were certain steps that had to be taken for a person to be recognized as a Confederate soldier. He had to enlist, be sworn in or take an Oath, and be read the Articles of War. Several years ago, I was reading through the Federal pension applications for William M. "Keith" Blalock. Yep. That Blalock. 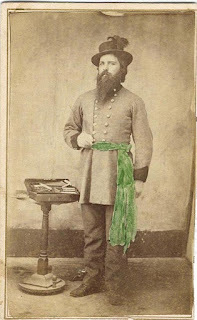 He enlisted in the Confederate army (Company F, 26th North Carolina Troops) on March 20, 1862, and discharged by reason of "hernia" and "poison from sumac" on April 20, 1862. In that month, he had time to get from his home in the mountains of western North Carolina, all the way to Kinston, down toward the coast. In his pension application, Blalock states that he was never officially enrolled in the Confederate army. Now, Blalock might have been lying (he certainly stretched the truth regarding his war-time wounds, at least in the eyes of the pension board), but his statement regarding his enrollment shows that there was a process that had to be followed for an individual to be considered a Confederate soldier. Step one in that process was to enlist or enroll. Early in the war, this was in a local company. Often, a member of the community would get permission to raise a company. When the company neared the number of required men, there were elections for officers. Usually (but not always), the person who had permission to raise the regiment was elected. 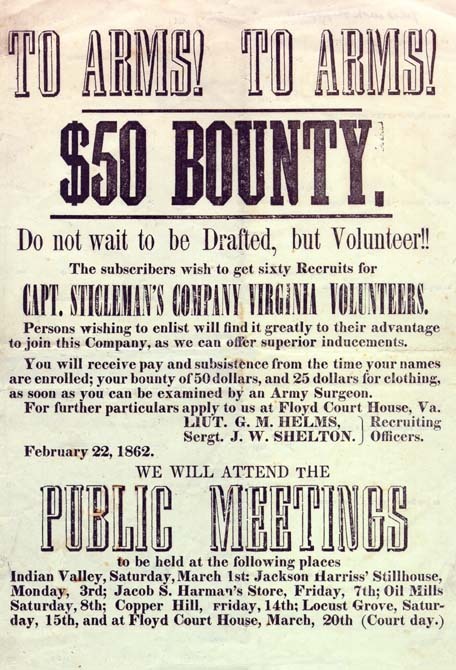 Local men in the community volunteered to serve, or enlisted in the company. Usually, some type of sheet was signed, the volunteer agreeing to serve for a certain amount of days - six months, or a year. The man was then enrolled. Step two was being mustered into service. 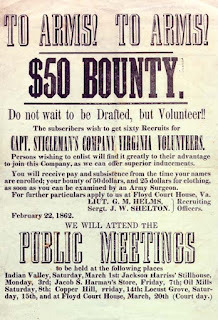 When a new company had enough men, the captain wrote a letter to the governor or state adjutant general, stating that there were enough men present for the company, and offering their services to the state. Soon a letter would arrive, ordering the company to one of the training camps. The new soldiers would load up and march to the nearest railroad depot, then embark for a training camp. (Usually, but there are always exceptions). Once there were 10 companies at one of these camps, the company officers were authorized to get together and elect a colonel, lieutenant colonel, and major. The regiment was created and then men mustered into service. A company could spend two or three months in a camp before enough companies were present to create a regiment. Once this was finalized, the regiment was mustered into Confederate service. 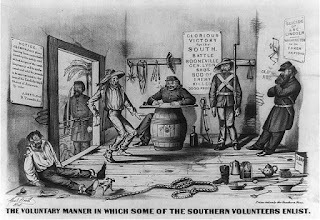 The way the Northern Press viewed Confederate enlistment. Back to old Keith Blalock. 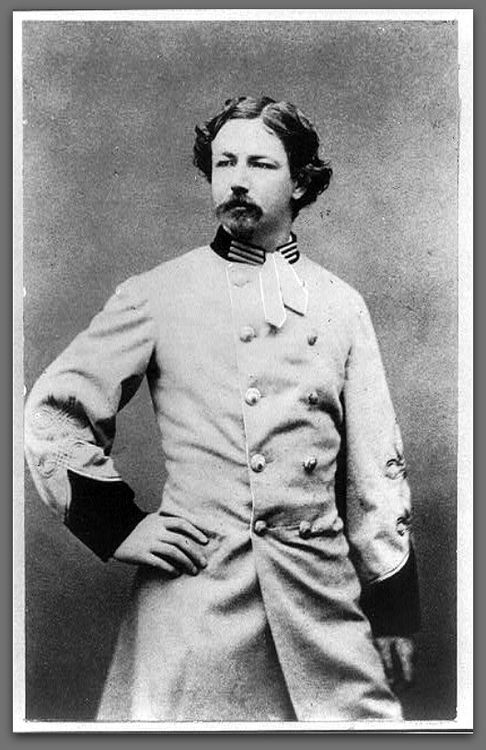 He wrote in his pension files that he was never officially enrolled in the Confederate army. He obviously volunteered and enlisted, but maybe he never swore that oath or was never read the Articles of War. While I do not think we can ever be sure, he obviously made that distinction. He did join the Confederate army, but he was never properly enrolled in the Confederate service. 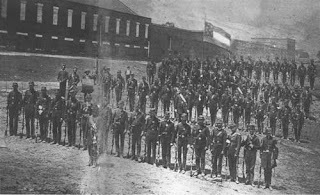 Company K, 4th Georgia Infantry. Last night, during my facebook live Sunday Night History discussion, I mentioned about how we really don't know how many Confederate regiments or separate organizations there were during the war. In William Fox's Regimental Losses in the American Civil War, published in 1889, he advances the number of 1,069 regiments, battalions, or batteries of infantry, cavalry, and artillery. Fox writes that there "were all troops of the line, and they served during the whole, or greater part of the war. The number does not include regiments which served a short time only; neither does it include disbanded or consolidated regiments, nor the State militia, Junior Reserves, Senior Reserves, Home Guards, Local Defense regiments, and separate companies." Looking at Joseph H. Crute, Jr.'s Units of the Confederate Army, I find 1,324 Confederate regiments, battalions, or batteries of infantry, cavalry, and artillery. Crute does include, at least in North Carolina, the junior reserves, but not the senior reserve companies. Going a step further, Stewart Sifakis's Compendium of the Confederate Armies: North Carolina (the only volume I have), lists 233 Confederate organizations from North Carolina. That differs somewhat from Crute. He only listed 91 separate organizations from North Carolina (compared with 240 for Virginia). Crute lumped all of North Carolina's artillery batteries into their respective regiments - i.e., ten batteries in the 1st North Carolina Artillery. The 1st North Carolina Artillery never functioned as a regiment. If we subtract 91 from Crute's 1,324, and add 233, we have 1,466 regiments, battalions, etc. I wonder if, after going through Sifakis's other volumes, what number we might come up with? None of these numbers includes the militia and home guard battalions. Should they be included? 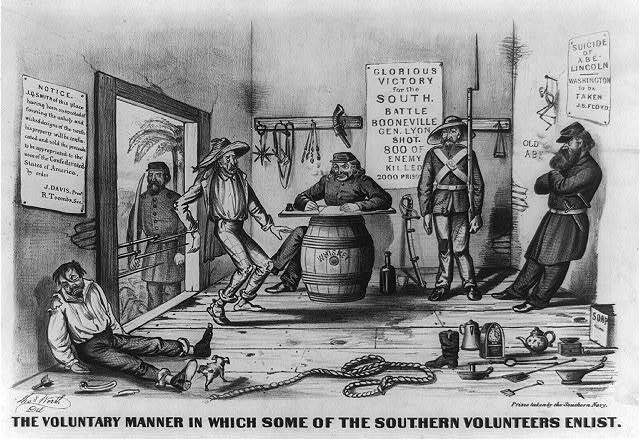 Both the militia and home guard were used to enforce Confederate Conscription law. And at times, they battled regular Federal forces, such as the skirmish in Boone, North Carolina, on March 28, 1865. Will we ever know how many Confederate regiments, battalions, or batteries of infantry, cavalry, and artillery there were during the 1860s? Probably not, but I'd like to come close. The Senator from Tennessee Accompanied Stonewall Jackson's Remains. For the past few weeks, I've been spending a great deal of time reading deeply into the history of the Army of Northern Virginia. Most of that reading has centered around the staff of various high-ranking generals. I've perused the letters or reminiscences of Francis Dawson, Charles Marshall, Moxley Sorrel,Thomas Goree, Campbell Brown, Jed Hotchkiss, Walter Taylor, Henry Kyd Douglas, and maybe one or two others. This past week, I've been reading Bean's biography on Sandie Pendelton. While I have read on Jackson and his death (and written about it on several occasions) something caught my eye and gave me pause. 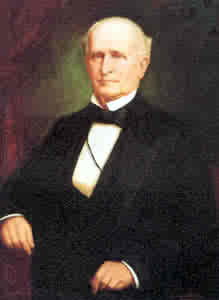 Pendleton was one of the officers who escorted Jackson's remains from Richmond to Lexington. Also in the party, according to Bean, are Jim Lewis, James Power Smith, Dr. Hunter McGuire, Governor Letcher, and Confederate Senator Gustavus A. Henry of Tennessee. (124) Why the Confederate Senator from Tennessee? Why not Allen T. Caperton or Robert M. T. Hunter, senators from Virginia, or maybe George Davis or William T. Dortch, senators from North Carolina? Mary Anna Morrison Jackson was from North Carolina, and the idea of burying Jackson in Charlotte was briefly considered. But why Henry? So I went looking into the biographies of Jackson. James I. Robertson only mentions Governor Letcher and his wife, and other "friends," but does not mention Henry. (728) Vandiver, in Mighty Stonewall, ends with his death and does not include burial. Neither does Farwell in his biography, nor Henderson in his. Burke Davis does, but not who escorted the remains. The same is true for Gwynne's Rebel Yell. Chambers writes that the party consisted of members of Jackson's staff, General Ewell, Governor Letcher and an aide, Col. S. Bassett French, "and a number of others boarded the train," but no mention of Henry. (2:455) Dabney simply states that the widow and General staff accompanied Jackson's remains, but makes no mention of anyone else. (731) Cocke makes no mention of who accompanied the remains to Lexington. Bean gives two sources for this information. The first is an article from the Lynchburg Virginian, published May 12, 1863. I checked all three of my online sources, and apparently, that newspaper has not been digitized. The second is the diary of William M. Blackford, which also does not appear digitized. (It is held by the University of Virginia.) Online research can only take us so far. None of that gives any indications that Stonewall Jackson and Henry, or Mary Anna Morrison Jackson and Henry, had ever met. Yet one of those two war-time sources mentions that Gustavus A. Henry was along for the train ride from Richmond, at least to Lynchburg. Maybe the next time I get to Virginia, I can track down these two sources. PS: Since Jefferson Davis and Henry were friends, did Davis ask Henry to be the Government's representative? Just a thought.